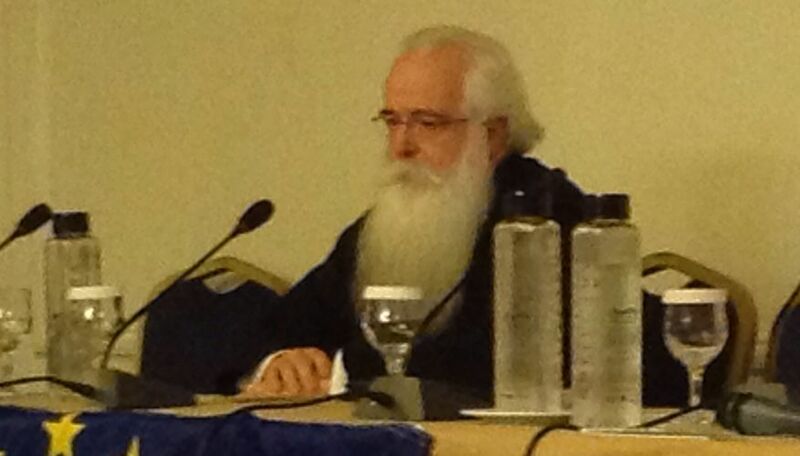 His Eminence Ignatius, Metropolitan of Demetrias and Almyros, the 3rd highest ranking leader of the Greek Orthodox ChurchIn a stirring challenge in the closing session of the State of Europe Forum in Athens, His Eminence Ignatius, Metropolitan of Demetrias and Almyros, the 3rd highest ranking leader of the Greek Orthodox Church, called on Europe to return to the Biblical view of "the person, not as an individualistic Ego which plots to attain sovereignty over everyone else, but an identity which «springs forth from a relationship», an identity which cannot exist except in continued and deep relationship with everyone else". He pointed the way to "the anthropological model that the Christian faith presents and which could constitute the solution to the existential impasse of European culture". This will rescue Europe from "radical economical neoliberalism", "extreme xenophobia", "high walls of bigotry", "dehumanization of the human being". Just a few years ago, discussion of European identity was at the center of public attention. Many opinions were expressed concerning the advise and place of Christianity in the formation of modern European culture. According to some, Christian churches contributed decisively to the foundation of the European system of ideals and peaceful coexistence and the prosperity of diferent peoples. There were many, however, who desired and continue to wish to exclude Christianity from Europe’s ideological framework, leaping - often under the influence of the Enlightenment and the Renessaince - directly to her ancient Greek roots. The whole debate remains essentially unresolved and continues to be ever timely, refusing to yield a final solution. Europe today finds herself yet again at a critical crossroad in her contemporary history. This time, the center of attention is not so much on the search for the spiritual roots of a united Europe - though at bottom discussion of this issue must be presupposed - as on the ways and means by which this union might be strengthened and rendered viable, and on the way that the peoples of Europe might overcome the problems they face so as to face the future with greater optimism. The problems that are now coming to the surface are neither unknown nor novel. In her long history, the European continent has faced with varying degrees of success the challenges of the times, sometimes yearning for the support and strength offered by Christianity and at other times renouncing her Christian identity in order to adopt often self-destructive tendencies - let us remember here religious wars and the World Wars - which tendencies inhibited her spiritual and sociological cohesion. Today this unity and cohesion are again in danger. The reasons are many. On the one hand, the demands of radical economical neoliberalism shake to the foundations the bulwarks of many local communities, driving to the margins large proportions of populations, while simultaneously it appears that political expedience leads to the neglect of the true needs of human souls. On the other hand, phenomena of extreme xenophobia across the European continent are reappearing, building yet again high walls of bigotry in the face of every form of difference. We are of the opinion that if these constitute the critical problems and dilemmas that Europe is called to face today, then Christianity’s contribution to their resolution is not simply important but imperative, since only the truth of the Gospel, correctly conceived, has the capacity to place the human being once again at the center of politics, of economics - in a word, at the center of life itself. So, what can Christianity offer to Europe, as the latter struggles to emerge from the impasse that she finds herself, (which she can do only by) rediscovering the Christian values on which she was built, even if in the name of so-called progress she denies them? The imminent economic crisis, as well as the ever-increasing xenophobic phenomena (beginning with Greece, but also occurring nearly throughout the European continent, often even in the most prosperous and influential European countries), present problems that, to a greater or lesser degree, lead to the dehumanization of the human being, underestimate his value and importance, destroy his dignity to the degree of throwing into doubt his own identity and security and restricting the mere possibility of peaceful, calm social coexistence. In this framework, the human being is brought face to face with the problem of his own survival, with a deep existential crisis, as he is often deprived, without himself wanting it or being responsible for it, of basic rights (to work, to medical care and legal assistance, to education, equality and self-determination and so on) which would provide him with the means and the conditions for a dignified, human life. Yet again, riches, money, social goods, gender, religion, difference, social position and ancestry, instead of constituting the opportunities for people to come together and live with the common goal of building a bright future, continue to be the cause of division, dissension, social injustice and grim exploitation. Christianity (and especially our Orthodoxy) offers a very simple alternative in the face of this situation, the polity of the person (prosopou). Here the person we are discussing is not the individualistic Ego which plots to attain sovereignty over everyone else, but an identity which «springs forth from a relationship», an identity which cannot exist except in continued and deep relationship with everyone else. The human being as a person is not distinguished based on his racial or social origin or on his religion, but based only on the fact that he is a person who, created as an icon of God, exercises freedom and love as constitutive components of his existence. The human being of Christianity (and of orthodoxy), following in the footsteps of Jesus Christ, is not built on any divisive or exclusive values, but in every way is founded on the unconditional and unbounded love for and solidarity with people, towards every other human being, to the Christian perspective of Europe, respect for the dignity of the human being and for fundamental human rights can never, in any situation, be set aside for the sake of any political or ideological expedience. It is obvious that the anthropological model of Christianity is to a large degree diametrically opposed to the current anthropological model, which is determined above all by the market’s economic indicators, or is marked based on differences in origin and religion. The person of Christianity, the anthropological presuppositions of which undoubtedly stand behind Europe’s numberless calls for human rights, freedom and equality between peoples, must now be situated once again in the foreground of public discourse, in an era when human dignity is being swept into the Gutter. God - the Word of God - became flesh, suffered and was ressurrected in order that the human being might overcome, once again and for all, all negative limitations that disintegrate his being and do violence to his human dignity. The Cross and the Resurrection present exactly the framework within which the human person is being built up in the context of the Christian faith. The Crucifixion of the old, egocentric, dominating human being, makes way for the Resurrection of the loving, supporting, open and collective way of being of the new person in Christ. This is the anthropological model that the Christian faith presents and which could constitute the solution to the existential impasse of European culture. Consequently, it is time for Christian churches (beginning with the Orthodox Church in the case of Greece) to emerge once again at the foreground in order to give appropriate answers to the challenges of the times and to the problems which Europe faces in our days, before it becomes too late to preserve the unity of the European people.